This is part 4 of 4. See part 3 here. 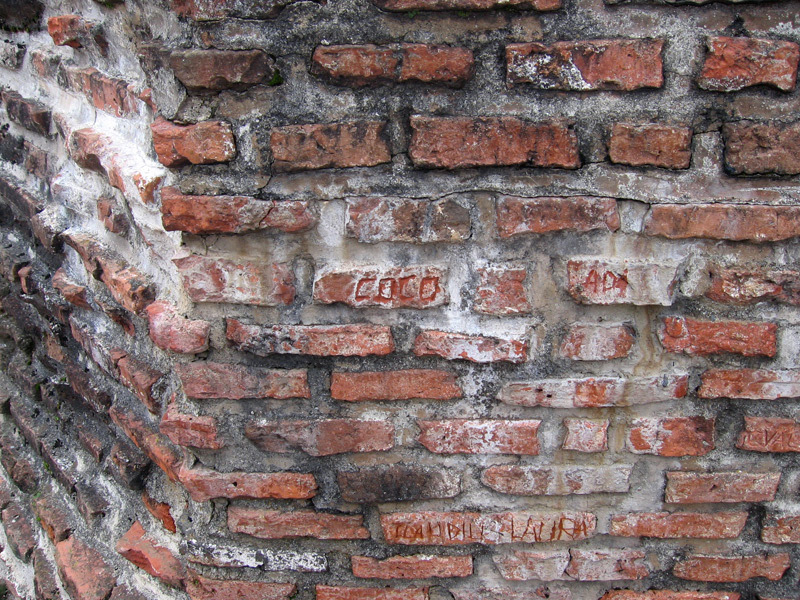 Graffiti near the top of the castle. I didn’t deface any of the walls myself, but I did pry a tiny gray rock out of the ground on the main path leading into the castle, to keep as a souvenir. I realized a few days later as I was flying back to Paris from Bratislava that I was flying on Friday the 13th with a rock from Dracula’s castle in my luggage. Not a great idea, but I came out unscathed. On my way out, this is back near the castle entrance again. That’s the tallest still-standing part of the original castle. Those rocks at the base of this side are actually fake; they’re big cement blobs to help keep the castle from sliding off the mountain. Wow, I’ve never heard of that one! That sounds great, and I’ll pick up a copy asap. If you haven’t read The Historian, I really recommend that one. I need to write an article for this site about that book, and a few other of my favorites, some day soon. Thanks for the effort made to get to Dracula’s castle. A friend of mine who must remain nameless here went to the castle ruins with its owner a few years ago after spending the night in an inn in a village nearby. Thanks for your photographs. I enjoyed them. 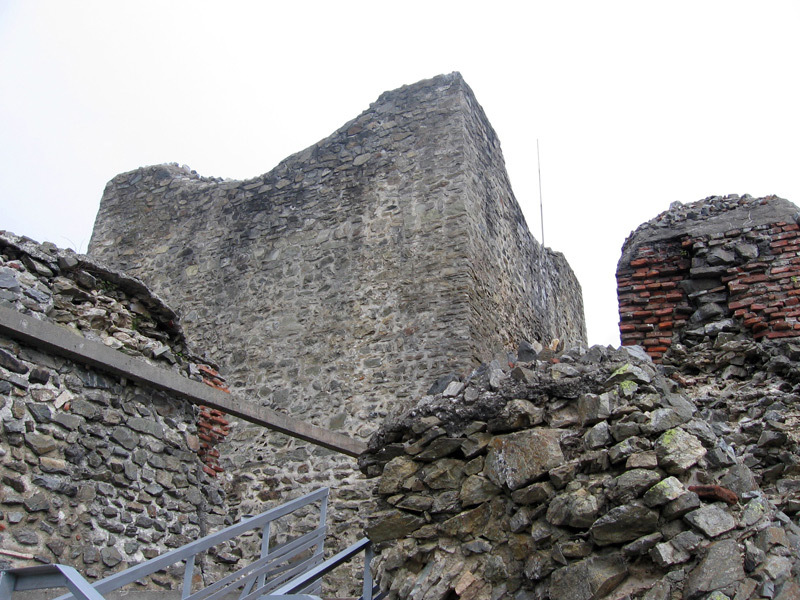 Just a note – Bram’s description is believed to be of Bran Castle, about 100 km north east of Poenari, outside of Brasov. 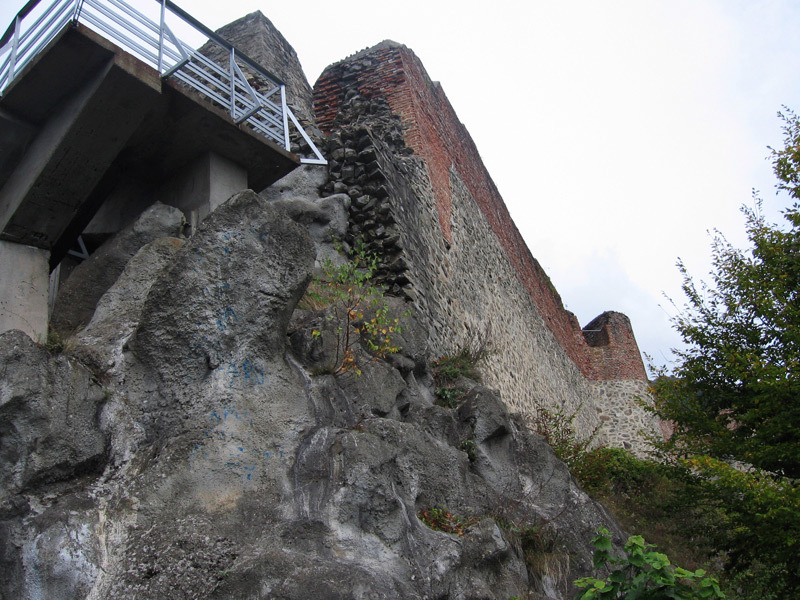 It looks like a proper castle and nothing like what Poenari Fortress probably looked like. Sorry 🙁 (I’m currently researching a trip through Romania ad have come across all of this info recently). Thanks for posting these wonderful pictures. We traveled there in May of this year and after that long winding road, we were not allowed beyond that gate you mentioned (listing in French, Romanian and English?) It was closed due to ???? Someone said that perhaps there was a small rock slide that is blocking the path. Now we will just have to return, but these entries and pictures will just have to hold us in the meantime. Bears, maybe? Researching Poenari for this summer, I came across a reliable source citing closure in Summer 2017 due to a mother brow bear and cubs. It’s made us more determined to go there tbh! Hello Manning.Because of your enthusiasm of Dracula and your pictures.I decided to reward you.Witches,Vampires the works are not imagination.Shape shifting and all is real.Good and bad entities exist,today…and are alive and kicking as I am.Believe.I am a Witch,that’s how come I know. HOW IS IT U KNOW THESE THINGS EXIST. I AM MOST FASCINATED WITH ALL THAT U SAY AND WOULD LOVE TO SEE PROOF MYSELF. BUT I FEEL IN MY BONED THESE THINGS ARE TRUE. I THINK IM JUST CRAZY SOMETIMES. BUT IVE ALWAYS HADDREAMS THAT COME VERY TRUE. Atomic matter (which includes us) makes up less than 5% of the universe. Do the math. Thank you for the pictures. I very much enjoyed looking at them. I do not have the means to travel so it is so nice to see the pictures and imagine being there walking through. Thank you again. Very cool. Thanks for posting these pictures! As I wrote in my reply to part one of your journey I am truly awestruck at what you have achieved and I truly wish that I had the time, means and money to do this trip. The closest I have got to Bram Stoker’s Dracula was a stay in Whitby in north east England, the place though a thriving residential area is very atmospheric especially when the sea mist enshroud’s the town. The town is well worth a visit especially as the UK Goth scene has taken Whitby as their capitol of Gothdom. Twice a year people flock there to dress in Gothic vampirish period costumes and this adds to an eery sense of nostalgia. If any one has access to Youtube then punch in Whitby England Goth or Vampire scene and you will see scenes of people in costume in Whitby. Manning what you have achieved has been just a dream for me and I may never achieve that dream but reading about your journey has really inspired me. Thank you. Thanks so much for sharing! I’m now planning a trip to Romania, and am most attracted by old ruins)) So this is helpful. Know what to expect. How long does it take approximately to walk up there? Thanks so much for the pics. Romania has always fascinated me and I’ve always wanted to visit to see these awesome castles and take in as much of the Vlad Tepes / Dracula lore as I can. I’d really be interested in learning more about your travels in Romania, particularly the do’s and don’ts of traveling in the country and what your best recommendations for getting there are. I’m one who thinks that the country is often misunderstood and therefore overlooked. I’d love to see all facets of Romanian life; should I ever have the privilege of going, I’ll definitely keep a travelogue — complete with cool pics! Thanks Manning, that was very intersting to read and well done with the pics. It`s good to see a lot of pictures from such a famous place. Good job :). Great work! I am very thankful you shared an experience as unique as this one. I’m going! I’m going! I’m going! If the Goddess of non-rev flights so decrees, I’ll be in Romania October 4th through the 15th. I honestly don’t think this would be happening if it weren’t for stumbling onto your site, Manning. How do you say “Thank you” in Romanian? I truly enjoyed the pictures, and the well written descriptions. Being third generation here in the U.S. it’s refreshing to see interest in the true historic home, and not just all the mythical hype. I have yet to get to visit my ancestral roots but, it’s on the horizon. Thank you again for sharing. I myself along with my Frenchman friend will be visiting next year. Can you advise on spending the night on mountain. Safe? Thank you for the pics and story! Great stuff. Loved your photo’s and story line. My sister visited the Castle in 1967 and said they were allowed to go into rooms and see Vlad’s living quarters but the feelings of impending horror made her feel helpless…real spooky. Things have chenged in the last 45 years. She agreed it was a haunting place. Vlad would be proud that you guys are still thinking of him. Good Job! Loved your photo’s and story line. My sister visited the Castle in 1967 and said they were allowed to go into rooms and see Vlad’s living quarters but the feelings of impending horror made her feel helpless…real spooky. Vlad would be proud that you guys are still thinking of him. Good Job! I agree the Historian was a great book. Do you know of any more in that style ? Loved your pics and story on this also. I really appreciate you taking the time to construct this web page. Fantastic! Thank you so much for sharing! Beautiful photos and great documentation… Thanks for sharing that! Manning! Remember me? It’s Tim from MBC – we shared a love for all things castlevania. I went looking for pics of poenari today and read to the end of your post before I realized I knew you. Looks like you made it out to Romania, I think when we first met I had just returned! Great pictures and review! I hope to visit the castle next month and this gives me some valuable information. Thank you! This is a fresh read! Thanks so much for sharing these historical pictures. The history of this place is amazing. I’ve heard Romania is a beautiful country and all the pictures I’ve seen prove to be accurate of the description. Visited in the nineties with two friends shortly after the wall came down. Only person we saw at the castle was a goat herder who was taking his goats down the mountain while we were on the way up. Where you can see how easy it was to block the road and the river traffic. Basically you could just drop rocks on people’s heads! To my mind this makes the castle an amazing tollbooth. Sorry was trying to say “the only picture missing is a shot from the edge of the castle down onto the road and the river. From there you can see how easy it is to block road and River traffic. Awesome post. Thanks for all the detailed photos. After reading it, I am inspired to go and visit myself, one day. Painting a picture of Vlad right now, and enjoying getting inspiration. THANKS! I am currently planning a trip to Romania and am looking for some tips, info on the grrat places to see. I want to know if it might be possible to spend the night outside/inside the castle safely? Would be exciting to do. Thank you for the pictures and commentary. Nice to know there are people out there who enjoy Dracula and all things related. So many different visions. I just found your site- your trip to Vlad’s castle looks fantastic! Can you give a rough estimate of what travel (mainly airfare) had cost you? I’m in Indiana (not sure how close I am to you). Anyway, thanks for sharing! I’m dying to go to Romania- I looks beautiful!